A festive atmosphere reigned in Oakland’s Civic Center Plaza late Wednesday afternoon as workers from the United Food and Commercial Workers union carried tray after steaming tray of burgers, beans and rice in for a mass feast. The union was one of many under the Alameda Labor Council umbrella that staged the giant foodfest for thousands of Occupy Oakland demonstrators, who called for a citywide “general strike” Wednesday to protest economic conditions. The line wound around the corner. For more of this story from the LA Times, click here. The Republican -backed recommendation in support of so-called right-to-work (r-t-w) legislation is a direct assault on Hoosier working families. The Republican proposal will lower wages, cost good jobs, reduce economic growth, and lead to higher taxes with fewer services. The Republican majority on the study committee chose to ignore the overwhelming empirical evidence that r-t-w will drain billions of dollars from the Indiana economy with lost wages, eliminated health care and pension benefits, and more workplace deaths and injuries. At the same time, public services will face an increased burden of more families in poverty and a smaller tax base. There was no empirical evidence presented to the study committee that r-t-w will result in a net increase in jobs. None! Not a single fact was presented or a single instance of an identified company declining to locate in Indiana because of the lack of a r-t-w law. In fact, Indiana already outperforms most r-t-w states in key measures such the unemployment rate and national rankings of states for business location. R-t-w is an unwarranted government intrusion in the private sector. It restricts the ability of private parties—private sector workers and private sector companies—to negotiate mutually beneficial contracts. State government interference will not improve the collective bargaining process. There is an economic crisis in our country. Poverty-rates and economic inequality are at record levels. Unemployment, loss of health and pension benefits, and home foreclosures threaten the middle class. From Montana to Mississippi, r-t-w states lead the nation with the highest poverty rates. Indiana should not go done the low wage path to increased poverty. We need an honest economic plan with an emphasis on education, training and community development. Hoosiers are ready to move forward. The Republicans on the study committee are taking us backward. I am proud to announce that the UFCW is endorsing President Obama’s reelection campaign because our members understand how much is at stake in this election. President Obama has stood up for the jobless, the uninsured, the middle class taxpayer, Medicare recipients, working women, and accountability from Wall Street. UFCW members are ready to mobilize for the president and to elect more leaders who will stand with him in Congress and statehouses across the country. Cashiers and grocery workers are ready to stand up to elect leaders who will ensure good jobs stay in their communities and that their children can achieve their dream for a better life. Meatpackers and food processors are ready to stand up to elect leaders who will keep fighting to hold Wall Street gamblers accountable to the home owners and retirees who have invested in their future and deserve security and honesty from financial institutions. Working families are struggling during this recession – a recession created by Bush-era tax breaks, lack of financial regulation and unnecessary military escalation. Turning our economy around is going to take a tremendous effort – an effort that must be led by a president who speaks for the 99 percent of Americans who clock into work every morning, instead of those who simply watch stock tickers all day. UFCW members are energized because corporate-backed politicians at the federal and state level have launched an all-out assault on working people. President Obama is fighting back. UFCW members have never stopped fighting back in statehouses and in their communities. They are ready to win the fight for the White House in 2012. The UFCW will be mobilizing, organizing and energizing our members, their friends and families to keep President Obama in the White House and to elect a Congress that works hard for hard working Americans. Ours is an enthusiastic choice to stand with President Obama as he fights against political opposition that seeks to enrich a select few at the expense of millions of regular Americans. 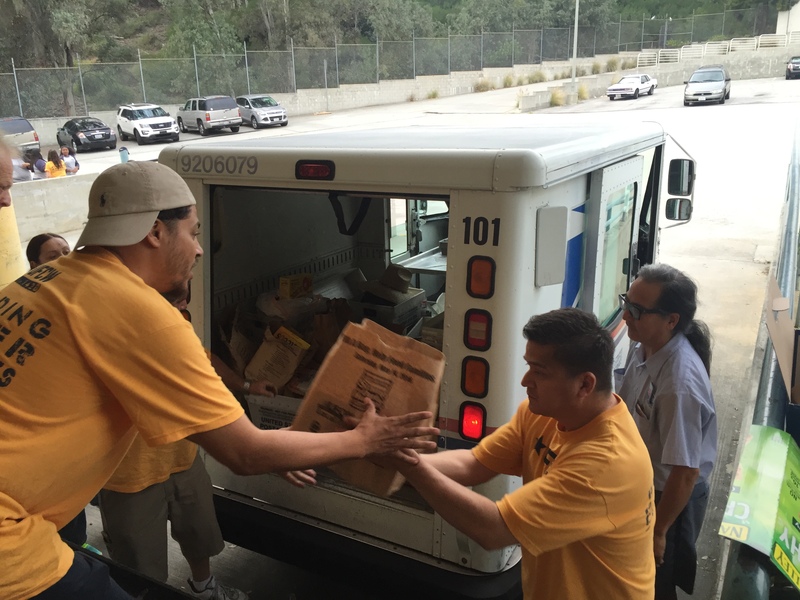 On October 11, nearly 800 UFCW Local 75 members turned out for a joint rally with Teamsters Joint Council 26. Then, on October 12 in Toledo, almost 300 Local 75 members turned out, joining members of Teamsters Local 20. Local 75 members took the time to come out for these rallies because they know how important it is to fight for good jobs in their neighborhoods – and that includes fighting to defeat Issue 2, Ohio’s harmful anti-worker law. Both rallies featured local firefighters and faith leaders, and Local 75 was proud to be joined by Teamsters International President James P. Hoffa. “Good jobs grow our communities. Good jobs allow parents to put dinner on the table, make a home, and to send their kids to college,” said UFCW Local 75 President Lennie Wyatt. “Politicians shouldn’t tell us that good jobs are destroying our neighborhoods; good jobs are what make safe, vibrant communities for all of us.” To see more photos from the rallies, visit Local 75 on Facebook. “The protest that began as Occupy Wall Street has now bloomed into a mass movement spanning more than 300 cities nationwide. Tens of thousands of people have taken to the streets to protest corporate greed and demand good jobs now. “The movement is spreading like wildfire, with Americans standing up for economic justice across the nation. This is a movement started by ordinary Americans, fed-up with the growing inequality in this country – people who simply want good jobs and a shot at the American Dream. The UFCW shares that vision for America. “The people “occupying” cities across the country are workers, students, and the unemployed. They are our friends and relatives, our neighbors and co-workers. They are fighting for the same things we are: good jobs, fairness, and an end to corporate greed and attacks on workers. And it’s part of a larger movement, one that started earlier this year as workers fought back against corporate greed and right-wing politicians in Wisconsin, Indiana, Ohio, Michigan, and across the nation. “In Wisconsin, hundreds of thousands of workers and outraged community members stormed the capitol in Madison after anti-worker politicians rammed through legislation attacking the rights of workers. In Ohio, over a million signatures were gathered to repeal Ohio’s SB 5. Corporate America has launched an unprecedented attack on our jobs and our rights, but the other 99% aren’t just rolling over. “So exactly what do we – the 99% – have to be so angry about? To begin with: worker productivity has been rising over the past decade, but wages have remained stagnant while the cost of health care has skyrocketed, leaving the average American struggling to make ends meet. Meanwhile, the gap between the richest 1% and the rest of us has gotten even wider. The United Food and Commercial Workers International Union (UFCW) represents more than 1.3 million workers, primarily in the retail and meatpacking, food processing and poultry industries. The UFCW protects the rights of workers and strengthens America’s middle class by fighting for health care reform, living wages, retirement security, safe working conditions and the right to unionize so that working men and women and their families can realize the American Dream. You can vote NO on Issue 2 today! The fight to repeal SB 5 is heating up. Voter registration continues until October 11. And – between now and October 11, you can register to vote AND vote early at the same time. Please take advantage of this opportunity. You can vote in person or by mail. Don’t wait … vote NO on Issue 2 TODAY! Click here for more information. Issue 2 puts all our families’ safety at risk. It makes it harder for emergency responders, police and firefighters to negotiate for critical safety equipment and training that protects us all. The same Columbus politicians who claim “we all must sacrifice” left themselves a gaping loophole in the law, making a special exception for politicians and upper management. Ohio’s public employees have already sacrificed—saving Ohio taxpayers more than $250 million through pay freezes and unpaid furlough days, and an additional $100 million in increased health care contributions from employees. It’s not Ohio values to let firefighters, police and teachers lose their rights and see wages and benefits gutted, while insiders, politicians and people at the top sacrifice nothing. Instead of creating jobs to fix our economy, politicians like Gov. Kasich gave away hundreds of millions in corporate tax breaks—draining our state budget without creating jobs—and passed flawed laws like SB 5 to pay back their campaign donors. Teachers, nurses, firefighters are not the reason Ohio’s budget is in trouble. Big corporations, their high-paid lobbyists and the politicians they fund are blaming middle class Ohioans for a problem they caused. Issue 2: Another example of the politicians turning their backs on the middle class.